Nadya is a Social Communicator and Journalist with a Masters in Communication, Development and Social Change. For the past nine years, she has worked in in international corporations, NGOs and governmental organizations, in areas such as public relations, networking, communication for development, and project management. She also has had the opportunity to participate in academic programs in Germany, Mexico, and Norway. During 2017 Nadya was an ICFJ (International Center for Journalists) Fellow at PeaceTech Lab in United States. She has gathered international experience, especially in Latin America, where she worked for more than 4 years, as part of the Rule of Law Program of Konrad Adenauer Foundation. 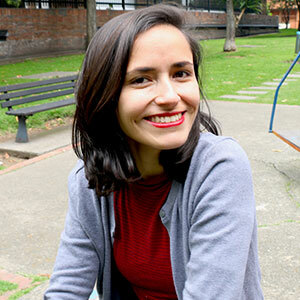 Nadya has also coordinated multiple projects in different regions of Colombia (like Diciendo y Haciendo), and has extensive experience in the management of alliances and in the coordination of projects and publications on issues related to democracy, human rights, transitional justice, peacebuilding, and the empowerment of local actors. Her favorite quote and mantra is: “Try to leave this world better than you found it”.